This garden surrounding a 16th-century Sussex farmhouse looks good all year round, with repeated swathes of planting, and curved beds to guide the eye through the site. The one-acre garden includes prairie plantings and carpets of snowdrops and narcissi which soften the more formal areas, while buxus and grasses provide structure and year-round appeal. A further two-acres of meadow add to the sense of space, and enhance the naturalistic planting schemes. Find out how this space has been transformed, then browse more real home transformations and find out how to plan, design and cost your garden transformation. The garden didn’t always look this good. When retired garden designer Jane Gates first moved here the garden was neglected and overgrown. Banks of overgrown laurels screened the view from the house and the mature yew hedges were in poor condition. After seven years in Jane’s care, the garden has been transformed. 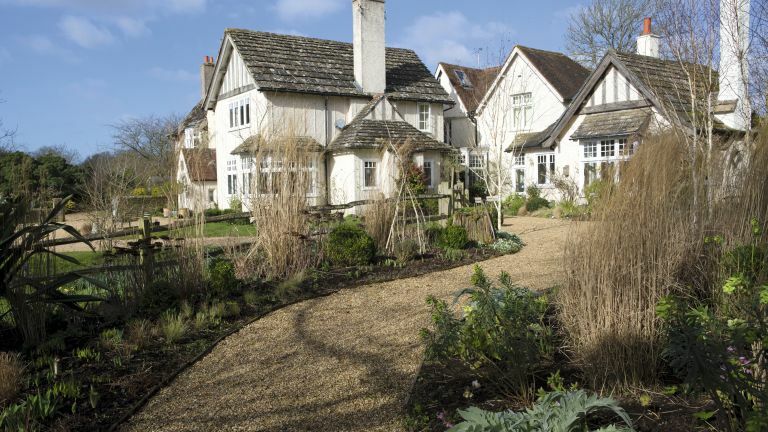 She created interest near the house, reshaping the beds in curves, adding 10mm shingle paths, and planting box balls with Libertia grandiflora running through. The laurels were removed with a digger and soil improver was added to the heavy clay on chalk ground. Twice a year, cow manure, lime and homemade compost are added to the whole garden. Planting was added in semi-shaded areas by the house for interest through the year, with hellebores, lily of the valley, scented daphnes, and inky black Ophiopogon planiscapus ‘Nigrescens’ followed by wisteria, roses and stipas, while succulents were added into the gravel. Eventually 11 Betula utilis var. jacquemontii were planted to replace the laurels, underplanted with repeated buxus spheres and ribbons of Stipa arundinacea and tenuissima, Miscanthus sinensis and Carex comans ‘Frosted Curls’. Later in the season black and white tulips, including ‘Queen of the Night’ and ‘Black Parrot’, will pop up through the textures, followed by masses of Allium hollandicum ‘Purple Sensation’ and Allium christophii. In the dappled shade of the mature trees, thousands of spring bulbs have been planted in swathes, snowdrops and narcissi which have naturalised over the years, along with Cyclamen hederifolium. Use grasses en masse for year-round structure, cutting them back in late Feb/March before the new shoots appear. Grasses such as the pheasant’s tail Stipa arundinacea are good to hide the tulip foliage. Don’t cut the carex, just take out the dead bits in early spring. They are amazing plants and so easy also to split and replant. Formally clipped buxus works well for structure, repeated among the grasses. Strappy foliage such as libertia, liriope, ophiopogon and hemerocallis is lovely for structure all year.